The nagging suspicion that Ireland are not as good as they can be is perplexing Joe Schmidt. And everyone else too. It all starts where every good and bad thing does, at the beginning. Ireland could not access the elite level of controlled aggression required to match England at the Aviva Stadium. Once they gave up ground, they could never quite claw it back. “I didn’t sense the same kind of energy levels that I would have noticed in November when the All Blacks came to town,” said Schmidt. “And if you don’t have those energy levels and have that mental preparation done, it’s pretty difficult to get a foothold back into the game. “I didn’t sense it. I didn’t feel that. You almost get this vibrancy from the group, and we didn’t quite have it. “It’s disappointing and difficult to put your finger on exactly what it was, but you’re talking about human beings here. The switch from passive to super-aggressive was not quite there against Scotland either. It was better, a good deal better. It just wasn’t anything close to New Zealand in November. So the man who knows almost everything about the game doesn’t have all the answers about how Ireland can be guaranteed to always get into the game. Could it be that the game has moved too far away from some of the roots that could keep it standing as strong and tall as an oak tree? First and foremost, rugby is a battle, a fight for possession of the ball, a fight for the territory on the other side of the gain line, a fight for position and, ultimately, a fight for the points that define the outcome of the fight. To be ready for the fight, a team has to be at an emotional and physical peak from the first whistle. 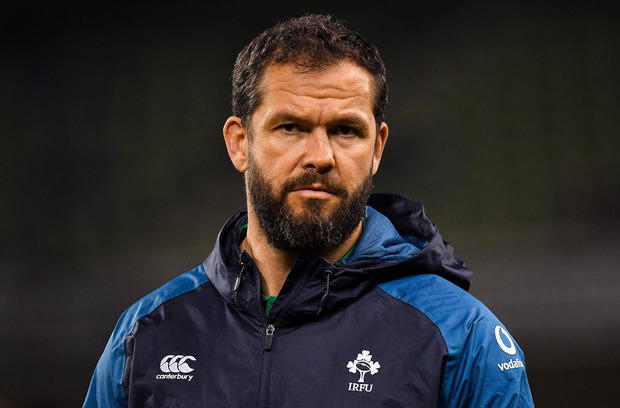 There has been a trend in recent months that lends itself to the argument that, for all of the process, discipline and organisation involved in making Ireland ready for a rumble, the old ways still have a place inside the dressing-room. The general public can only take what Schmidt has spoken as gospel. What happens between the time the coaches leave the leaders to take control and those precious opening moments that can mute an audience or whip it into a passionate, raucous frenzy? When the Ireland out-half was given the armband for Munster at Thomond Park, he set the tone from the get-go. And not in a good way. The over-aggressive nature of Leinster’s play all started with Sexton losing control after a hit from Fineen Wycherely. From there, the boys in blue grew more familiar with yellow and red as Cian Healy and Tadhg Furlong were binned and James Lowe was sent-off. That was a case of aggression without enough control. Despite Peter Stringer’s comments about Farrell being something of a hothead, it looks like the England captaincy could be the making of him. For all the backroom changes made by coach Eddie Jones, it is the appointment of Farrell, on limited evidence, that has produced a more controlled leader. With great power comes great responsibility and the out-half has managed to temper his aggression, and channel it into performing in a way that only inspires those around him. He has shown controlled aggression. The Ulsterman is a fine captain for the calm he brings and the measured relationship struck up with referees. The comparison to Paul O’Connell, our last great motivator, are irrelevant for two different men. These days, there is so much more made of the process, of how ‘the master motivator’ is not as relevant. But there has to be passion with precision, so that Ireland can fight on both of those fronts. The England captain’s father Andy is a master motivator. Could he be the missing link Ireland needs in those precious moments before battle begins?